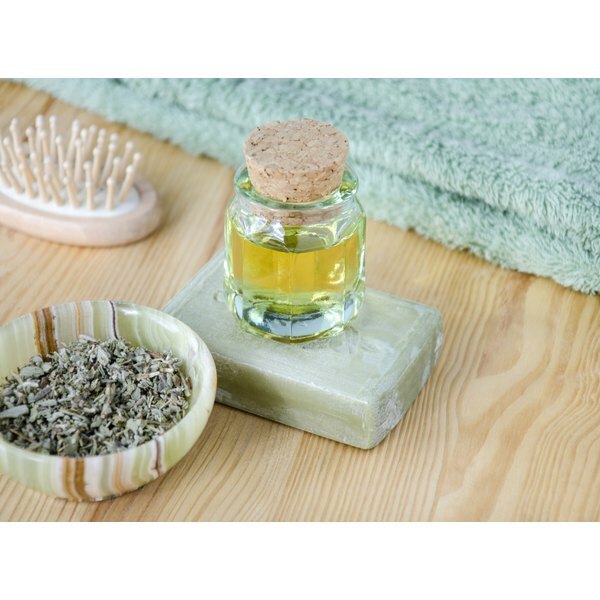 Essential oils are liquids that contain aromatic plant compounds and are often used in aromatherapy in an attempt to alleviate stress and increase relaxation. The term "essential" refers to the oil's fragrance, or essence, which is captured in a carrier oil, such as olive oil or sweet almond oil. Many users will often make their own essential oils at home using fresh herbs and fruits. Creating your own essential oils allows you to design custom fragrances, save money and ensure the oil's purity. Prepare the plants that will be used for the fragrance. Wash them thoroughly to remove any dirt, trace pesticides or other chemicals. Place the almond oil, two drops of vitamin E and herbs, fruit peel or flowers into a pot on the stove. Vitamin E acts as a preservative. Gently stir and place on low heat for four to eight hours. Do not bring the mixture to a boil. Strain the cooked mixture through a cheesecloth into a sterilized Mason jar. Seal the Mason jar while the mixture is still warm. Mark the creation date on each jar. Store any jars that will not be used immediately in a cool, dark area to prolong shelf life. If stored correctly, the normal shelf life for homemade essential oils is six months. Slightly bruise the plants by tapping them or gently rolling them between your fingers to increase the fragrance imparted to the almond oil. Another option to stove-top cooking is to place the mixture in an oven set at 150 degrees F for two hours. Do not ingest essential oils. They are meant for topical use only. Do not use a a metal ring to seal the jar as various metals can contaminate the oil. Use a rubber ring instead.